Get excited, because a new month means new arrivals! And with the holiday season in full swing, we have a ton of brand new little lovelies for you to choose from. That's why we're coming back to you today with a roundup of our Top 4 Picks from the December Collection. Get ready for party picks, workwear staples, and much more! We think these would look perfect in your wardrobe...so what are you waiting for? Ready, set, shop! “Gorgeous dress for work! Fits beautifully, perfect length, and very professional.” - Adriana L.
Our flouncy, feminine, pretty-meets-professional Charlotte dress. 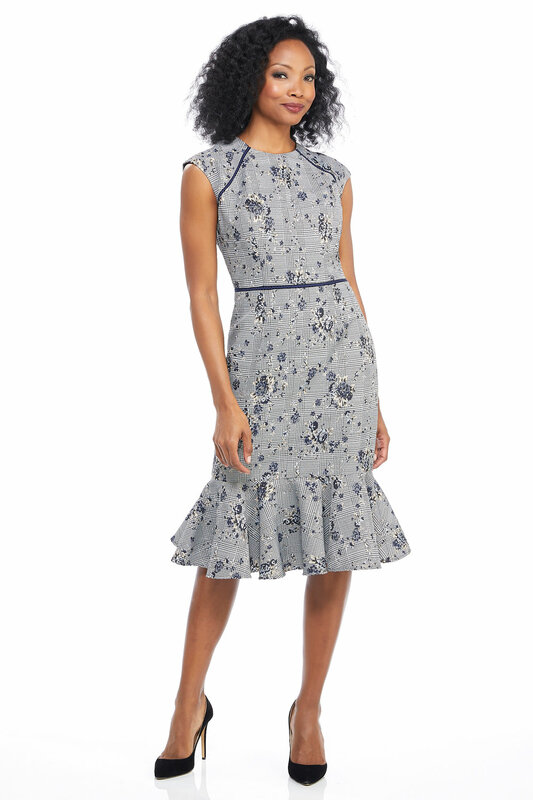 With its easy, neutral palette and exciting combination of houndstooth plaid and soft floating florals, this dress is a true class act. “I absolutely love this purchase and received so many compliments! It's fun, flattering, and feels different. You can dress it up or down. I wore it to a work holiday party with heels!” - Elyse C.
The Rina Jumpsuit is also available in Petite and Curve sizes. The Charlotte Flounce is also available in Petite sizes. The Bianca Midi is also available in Petite sizes.